Frolicking mists touch gently upon the still waters of an emerald lake, as you gaze hand-in-hand at the breaking dawn over mountainscapes. 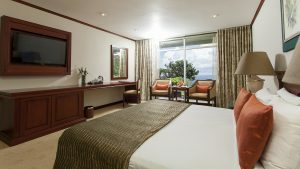 Welcome to the most sought after honeymoon hotel in Sri Lanka, Amaya Hunas Falls. 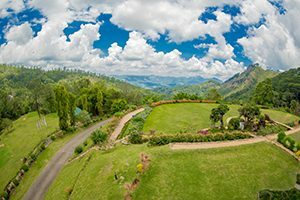 Located approximately 30 KM from the ancient hill capital of Kandy, this boutique hotel is a member of ‘Small Luxury Hotels of the World’ and is known for seclusion, privacy and world-class service. Sprawling gardens with walkways, a lake with a bridge, a waterfall and a mini golf course all constitute the most scenic backdrop to world-class luxury accommodation. Find romance at Amaya Hunas Falls and embark on the perfect honeymoon in Sri Lanka. 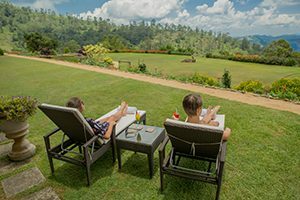 Situated at the foot of the Hunasgiriya Mountain, the hotel has 31 rooms and suites, featuring dazzling views that can be enjoyed from the privacy of sit-out balconies. Designed with peace and relaxation in mind, these luxurious accommodations offer state-of-the-art amenities and unparalleled levels of service. The crisp air paired with the mountain breeze enhances the dining experience at Amaya Hunas Falls. A range of mouthwatering cuisine is offered at the hotel’s restaurant to satisfy the hearty appetites built up by the cool climes. Any meal at Amaya Hunas Falls is always a treat. With a wide range of activities to choose from, Amaya Hunas Falls appeals to any type of traveler. Choose from a spectrum of options, designed to appeal to a wide range of travelers from those adventurous at heart to those with a yearning to be pampered. A leisurely game of golf at the hotel’s beautifully maintained mini golf course is the perfect way to practice your swing and to spend a pleasant evening outdoors. Retreat to the hotel’s secluded pool area and laze the hours away under the sun. Simply dip your feet into the pool or lie on one of the loungers and immerse yourself in complete relaxation. The hotel offers a hotel-owned souvenir shop for guests to take back with them a few mementos of their visit. Available items include a range of Sri Lankan tea, plenty of picture post cards, cultural books and magazines. Improve your serve and volley at the hotel’s tennis court and discover your inner tennis star. With the use of complimentary tennis equipment, the court is bound to delight beginners and advanced players alike. For the book lover, the library at Amaya Hunas Falls is the perfect getaway. Offering a range of genres to select from, the library invites guests to bury themselves in a good book and lose track of time.